God knows our heart. He knows what is within us at our greatest depths, he sees behind any excuses and justifications that we make to ourselves in attempt to validate things we know deep down are not right, he knows every little inner lie and deception…..but he also knows our struggles, our weaknesses…..and our strengths, efforts, goodness, and love. He knows it all. There is nothing that we can hide, even if we try to conceal it from our own selves. 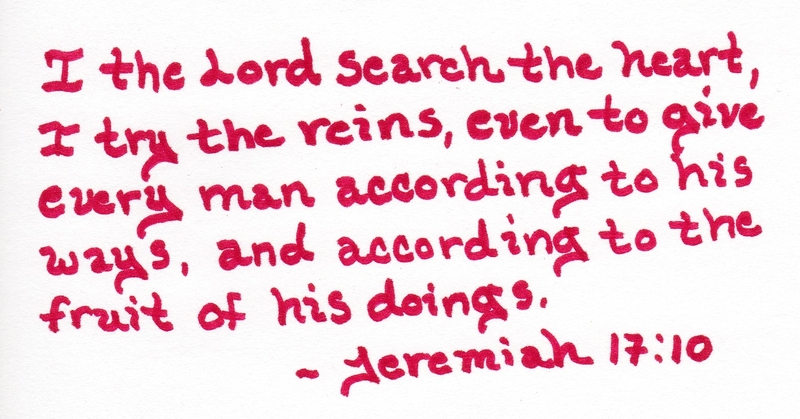 “I try the reigns”….possibly indicates that we are tested in some way according to what he sees within us. We may be tested due to lessons that we are seen as needing to learn, or given trials to evaluate our weaknesses and whether we can overcome them. He knows what tempts us, what our past failings have been—thus it is likely the things that we most struggle with that will be used to test our faith and loyalty… as well as to grow them. Tests are not meant to be easy. In life we do not give children simple tests designed to cater to their strengths, and what is effortless for them…but rather tests are an instrument to make one work, learn, improve, be challenged etc….so too does Heavenly Father likely examine us, and test us via what he knows our weaknesses to be, and where we need to be refined. He may also test us to see weather we choose him, or instead take paths towards temptations … which could lead us to adversity, and even harsher lessons if the “test” is failed. “And give every man according to his ways, and according to the fruit of his doings.” This indicates that Heavenly Father gives to us according to what he sees within us, as well as what choices we make, how we live, how we treat others ( and likely whether we choose Him, follow the teachings of the gospel etc…). Depending on the results, what is given could be blessings/ rewards…..or it could just as well be tribulations, and negative consequences due to caving to temptations, weaknesses etc… or even having dark elements within. We might even be tested multiple times in the same form until we “pass”, and then can be given greater things. It can be compared to driving. Do we just hand kids keys to drive? No. We teach them, and put them through challenge courses….and ultimately test them to see if they are ready to have that kind of responsibility and reward. If they fail the test, then they get put through the same challenges once again until they prove themselves ready, worthy, and responsible enough for greater blessings (in this case, the ability to drive). This could be said for anything precious we wish to achieve or receive. We typically want to see someone grow, and prove that they are ready to be entrusted with something that is a treasure, thus we do not just casually drop things in the hands of someone who has unsolved issues that could cause destruction on whatever ( or whoever) that blessing is. So, shiny temptations ( based on what is seen within us) may be dangled in front of us to see if we run off the path to grab for them, or if we are strong enough to stay on the path/ His plan, and prove both that we trust Him, and that we are ready to be entrusted with greater, true blessings. To some it may sound like God is cruel to test us, put us through trials…make us have to reap the consequences of wrong choices etc….It may even look like punishment…. but really, it is all about love. It is about helping us to grow and overcome the issues that he sees within us. Without lessons and trials, without being made to face what most tempts and challenges us…. we cannot grow, or move closer in his direction, let alone be entrusted with precious things and privileges. Additionally, we are given what is needed to grow our faith, to help us see clearer, be receptive to the Spirit etc….none of which is something we just instantly come by. Sometimes it is through straying, or failing tests–seeing what it is like not to be on His path, in His light….that we learn the greatest lessons….. thus another possible reason why our greatest weaknesses and temptations are used in our “tests”….so that we can learn first hand what is truly “right”, and where we should place importance in our lives and choices. Ultimately, we are here to learn, grow, and choose if we desire to follow His plan–thus we are given the experiences individually tailored to help us to achieve those things. At times, it may help us to remember that he knows what is within us, down to our utter-most bottom layer— it could encourage us to examine our own selves closer, and be more honest with ourselves… and the things we may need to improve on and change. It becomes harder to uphold inner justifications, and any “pretending” we may do to convince ourselves (or others) of things….if we pause, and think, “What would Heavenly Father say about what is inside of me on this matter? Would he say that my justifications are true…or would he see them as a means to hide truth….” Often, that could hold very crucial answers for us, and help us to see more clearly, and make better choices for ourselves….especially if we are in the midst of being given an important test unawares.